I’m David, I live in Catania(IT) but I like to move for long periods and live in different cities. Maybe someone says I’m a designer but overall I’m a gamer. 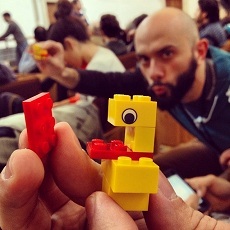 In 2012 I was in Florence and with a lot of other people I contributed to foundation of Fablab Firenze. Than in Catania I’ve joined and ruled the Hackspace Catania that today I can call “Home”. I started discovering this world in 2011 from 3D printing, a powerful tool for every product designer, and so it has become my thesis. For me the Fab Academy is an opportunity to extend my skills in digital fabrication and a way to find new reason to reach new cities. I really like games, especially boardgames and RPG. A game has usually a set of rules, some tool to play with and motivated people who decide to play the game. That’s a game for me.